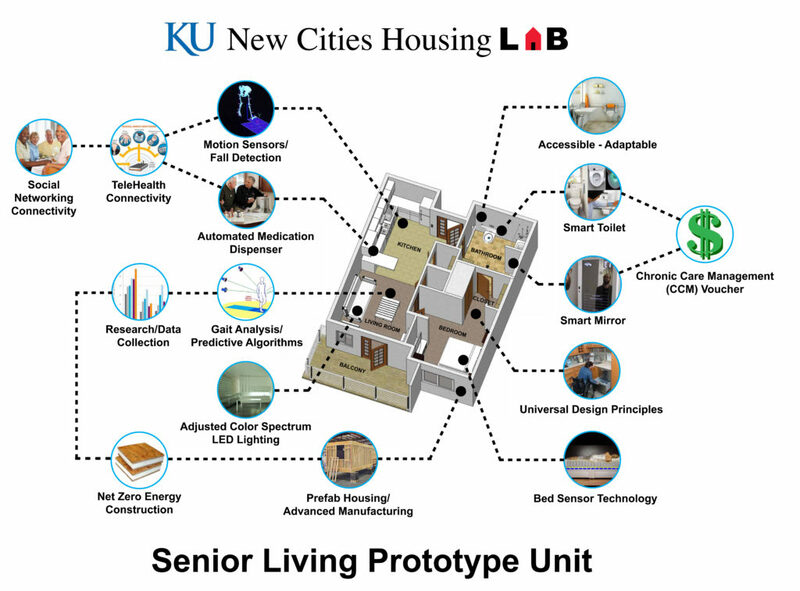 The latest and biggest project of Kansas University's New Cities Initiative is the Housing Lab, a prototype senior housing unit featuring high-tech devices such as dehydration sensing toilets and fall-detecting motion sensors. Smart toilets, fall-sensing cameras, automated medicine dispensers, gait analysis detectors — this isn’t your typical senior housing unit. 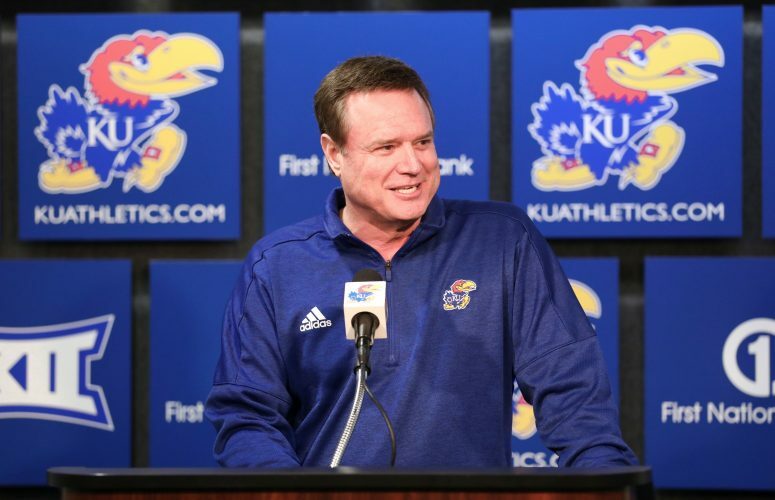 As so many things evolve to keep up with the latest technology, so is Kansas University’s New Cities Initiative. The New Cities Housing Lab is one of the latest and biggest projects of the New Cities Initiative, an interdisciplinary research project based at KU’s School of Architecture, Design and Planning. 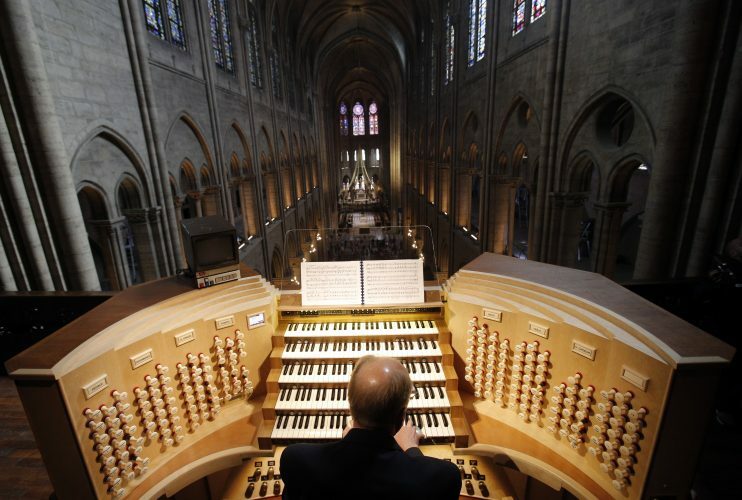 It aims to address the “built environment” needs of the country’s aging population. The New Cities Initiative, started in 2010, spurred research, seminars, classes, design studios and talks including the Boomer Futures Think Tank. “It sort of elevated KU as a real player in the field of gerontology,” said Joe Colistra, associate professor of architecture and a lead researcher with the New Cities Initiative. Founding director and architecture professor Dennis Domer retired from KU last year but remains involved with the initiative. One major project was designing an intergenerational neighborhood, dubbed Campus Village. While plans to physically construct such a community in Lawrence didn’t come to fruition when they reached the city a few years ago, students continue to work on the concept. The Housing Lab project focuses on a smaller part of senior living: a single unit. It builds on information gathered over the past few years, Colistra said. Features of the Housing Lab unit offer solutions to problems older residents face. 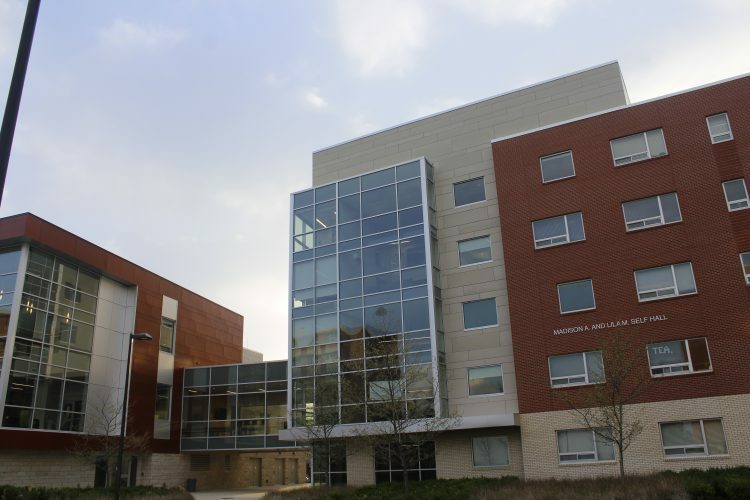 KU groups helping to identify those problems include KU Medical Center’s Landon Center on Aging, the KU Gerontology Center and the KU Life Span Institute, Colistra said. Manufacturing companies are hoped to partner and provide needed technology.
? Research has indicated that in the early stages of diseases such as Alzheimer’s and Parkinson’s, a patient’s coordination and balance change slightly but not enough to be visible to even a doctor’s eye, Colistra said. Gait analysis cameras connected to computers that analyze patterns could help detect those changes.
? Falls have been identified as a leading cause of injury and also death for seniors. Dehydration is a common culprit, Colistra said. A “smart toilet” that automatically tests urine for dehydration could, if detected, alert caregivers to problems or even alert an automatic medication reminder.
? Another technology, fall-detecting motion sensors and cameras, could notify caregivers in the case of a fall but also be rewound to help healthcare providers determine what caused the fall and what body parts may be injured from it.
? 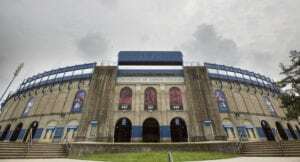 Another very important component of the newfangled devices would be their ability to collect data that KU could use in long-term research, Colistra said. The special housing unit is a ways from becoming reality. 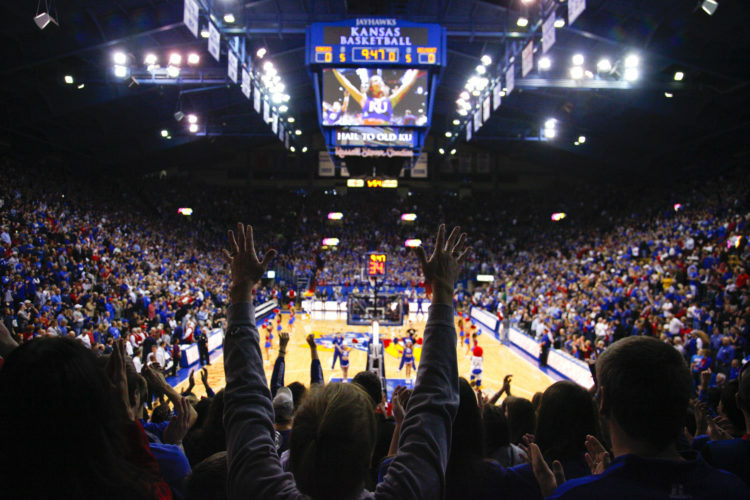 For now, KU architecture studio classes are working on the project, Colistra said. Over the next year, they hope to get industrial partners on board and construct a 700-square-foot prototype unit inside the architecture school’s East Hills Construction Innovation Lab. With a model unit, Colistra said, students could test products and design, and — hopefully — eventually get their senior housing solution built and on the market in the real world.